↑ Harbach, Ralph (November 2, 2008). "Family Culicidae Meigen, 1818". Mosquito Taxonomic Inventory. http://mosquito-taxonomic-inventory.info/family-culicidae-meigen-1818. ↑ Brown, Lesley (1993). The New shorter Oxford English dictionary on historical principles. প্ৰকাশক Oxford [Eng. ]: Clarendon. ISBN 0-19-861271-0. 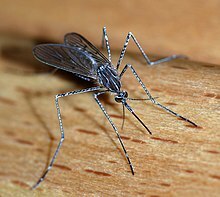 ↑ "Mosquitoes of Michigan -Their Biology and Control". Michigan Mosquito Control Organization. 2013. http://www.mimosq.org/mosquitobiology/mosquitobiology.htm.